Hokitika was a fun little town to spend the morning exploring. 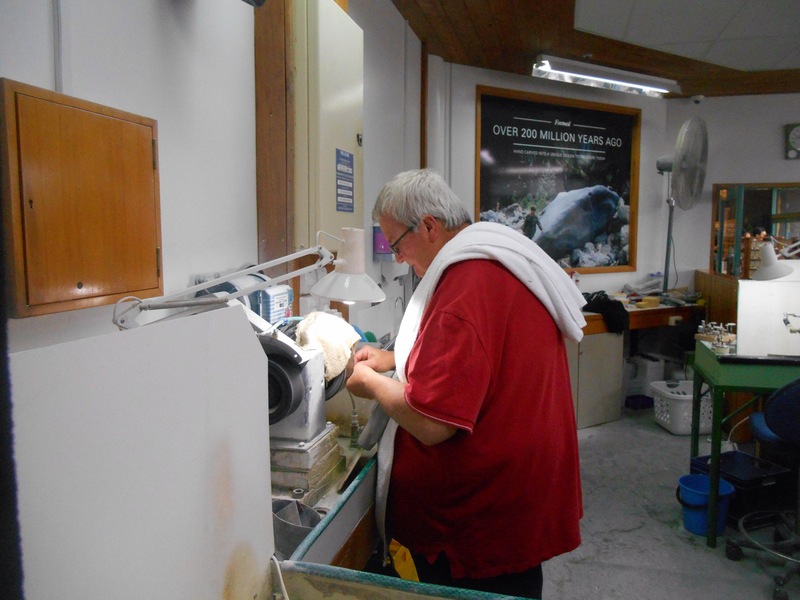 Starting in reverse, with Hokitika’s most recent export, we went to Mountain Jade, a shop selling and showcasing the various types of Jade or Pounamu found in the region. We had a short walk around seeing the crafters manipulate the stone, grinding and shaping it based on the grain, and polishing it to make beautiful jewellery and trinkets. 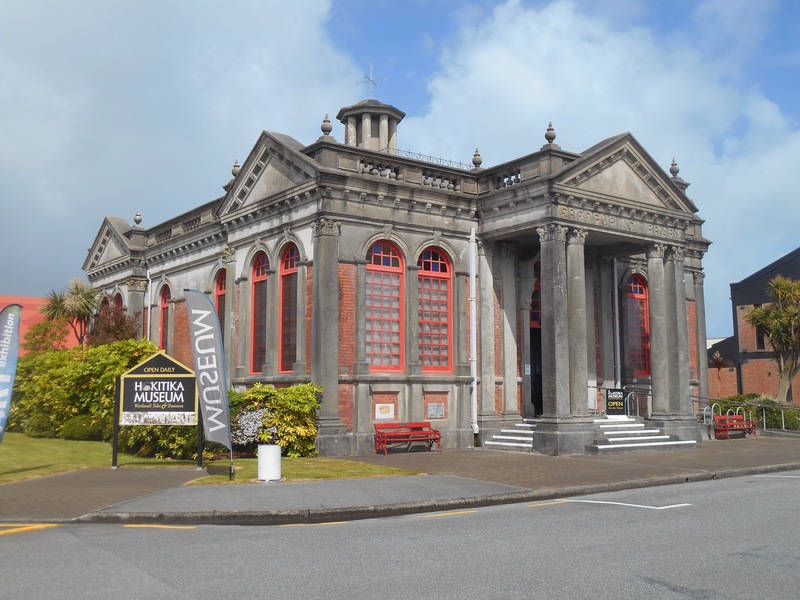 After this we satisfied the coffee and cake segment of the day at the Regent Theatres little tearoom, then I headed to Hokitika museum, housed in the building of the original library. The museum highlighted the towns main exports, first gold, followed by Pounamu then it’s great whitebait catches. Each gallery afforded great photos of the town through the years, brought even more to life for me through reading The Luminaries and imagining Walter Moody walking Gibson Quay. For lunch we took our picnic to sunset point, the end of the beach and the start of the quay which would once have been filled with boats of prospectors, more arriving each week to make their fortune. 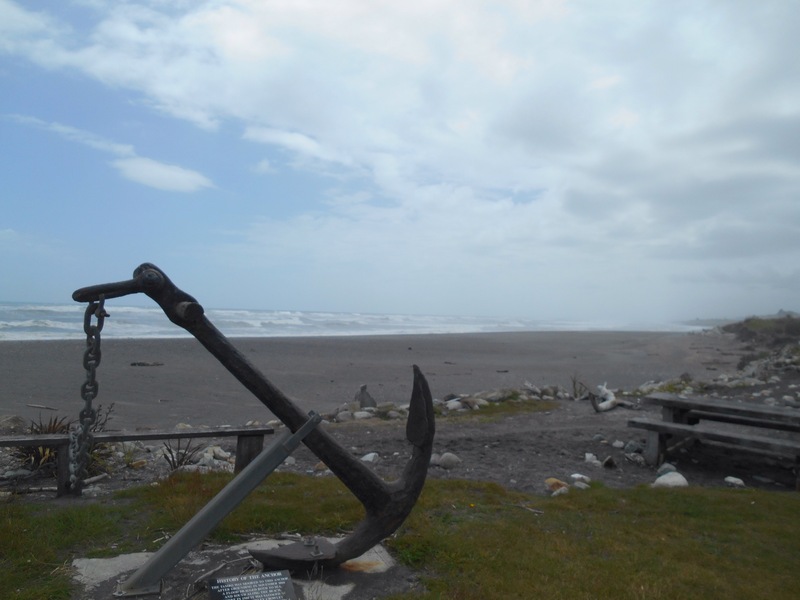 The wildness of the west coast and the strength of the Hokitika bar resulting in over a hundred shipwrecks during just a few short years, averaging one every 10 weeks. We continued on the last stretch of trail to Ross, passing around Lake Mahinapua, then following a long coastal path which was still under construction. 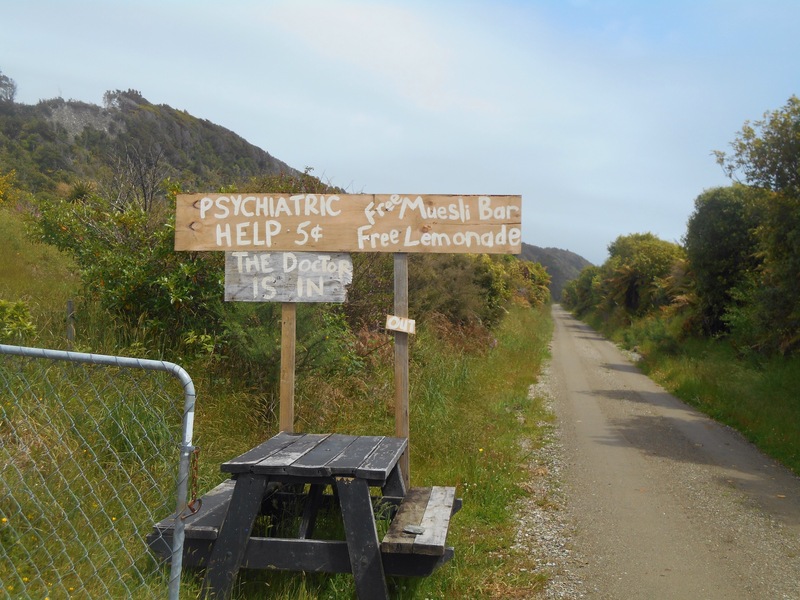 We encountered an interesting sign offering psychiatric help and wondered whether the isolation of this place led many people to take up this offer. Late afternoon we pulled up to camp at the Empire Hotel in the gold mining town. Over dinner we met Robbie, an entertaining Fijian, lacking many front teeth due to his time playing Rugby all over New Zealand, now working in the still functioning mine. His boundless enthusiasm, coupled with his funny toothless pronunciation kept us entertained for the evening. We got packed away without managing to get wet, and made good time along the route to Hari Hari. Again passing lakes and greenery but now on the highway, being passed by tourist cars and campers. The 75km target for the day had little in the way of scenic stops, the goal of Whataroa being based more around a target distance than any desire to visit the settlement. Post lunch the rain unleashed from its drizzle to downpour. I pulled up at the hotel, dripping, enquiring about camping where I was firmly told that although they do accommodate camping, we would be taking a bed and not to be so ridiculous. Did we not realise we were visiting a rainforest in spring and could our bike money not have been better spent on a camper for goodness sake? So that was settled. Despite a bag of hot chips we were too cold to peddle on and we were installed in a twin room, drying our trainers by the fire for the rest of the afternoon and evening. Still to the confusion of the hotel owners, we left on our way to Franz Josef. The morning was mostly dry and Alice and I were both plugged into podcasts of Radio 1 so were grinning along happily as the tourist traffic tooted as they passed us. By lunchtime we were in the township, all set up to accommodate travellers and trips to the glacier. 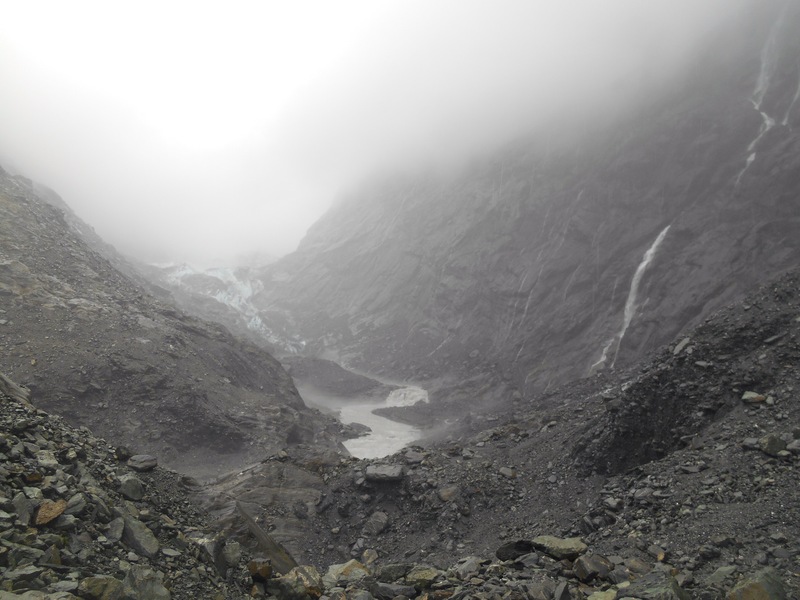 We were having lunch when the rain caught up with us and so decided to stay the night rather than push on, so we could make a break to walk the glacier at any clear and opportune moment. The glacier is just out of town and retreating further and fast. The wet weather causing the rivers to flow fast and full out of the valley was deafening, coupled with the rustling of my emergency poncho. Walking toward the mountain fold containing the ice was mysteriously misty and grey, the ground is boulders of fallen rock. 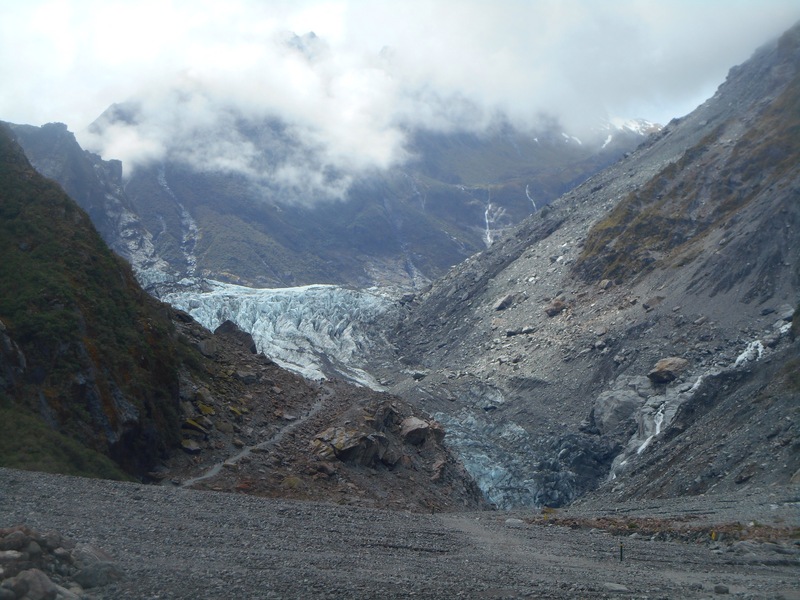 Upon reaching the glacier, we saw the ice peaking out from between the mountain folds of the southern alps. Walking back out of the glacier, the clouds lifted slightly and the vibrant greens of the plants and moss on the walls became more apparent, as did the oranges of the rocks at the waters edge. The many waterfalls rushed off the mountains ranging from trickles to large downpours. I also walked to Peters pool, a kettle pool formed from a lump of ice left in a depression from when the glacier retreated, now stranded as it’s own little lake. Back at the hostel, free soup was provided in the kitchen, a lovely warmer at the end of another wet west coast day. We made very good time and passed through the town to the glacier which had a breathtaking valley approach with perfectly straight rock to either side. The walk wound around, concealing the glacier and then showing the wide face of ice. 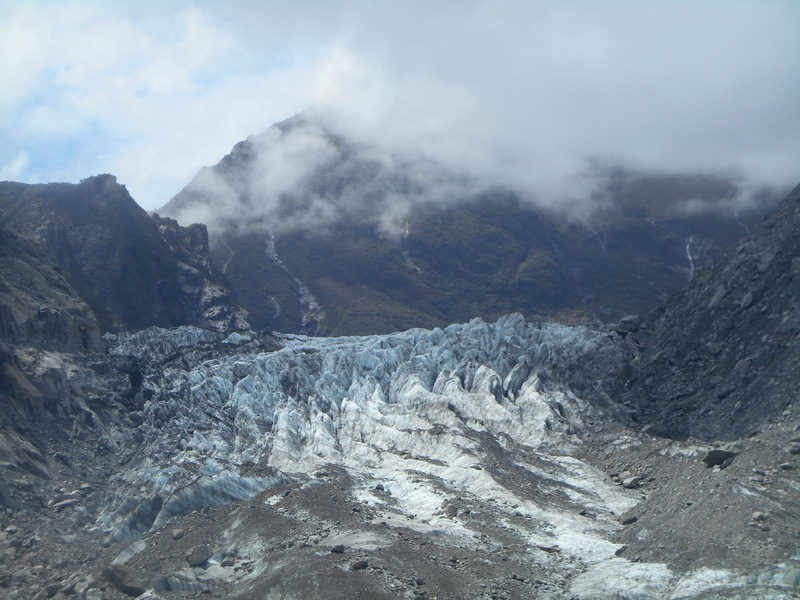 A larger area was visable than at Franz Josef, a serrated edge of ice much like the teeth of a comb. Again the vibrant greens and oranges of this area were incredible. The previous evening we made our plan to abandon the west coast from Fox Glacier as the wet weather continued to be forecasted for the next few days, and the constantly wet trainers was becoming a challenge for our morale and our noses, so we headed back to the town to check out the souvenir shops and wait for our bus. The highway follows the coast to Haast, then heads inland to Makarora which is where we had elected to stop, still wanting the ride into Wanaka but hoping we were further enough inland to avoid the wrath of the dark clouds. 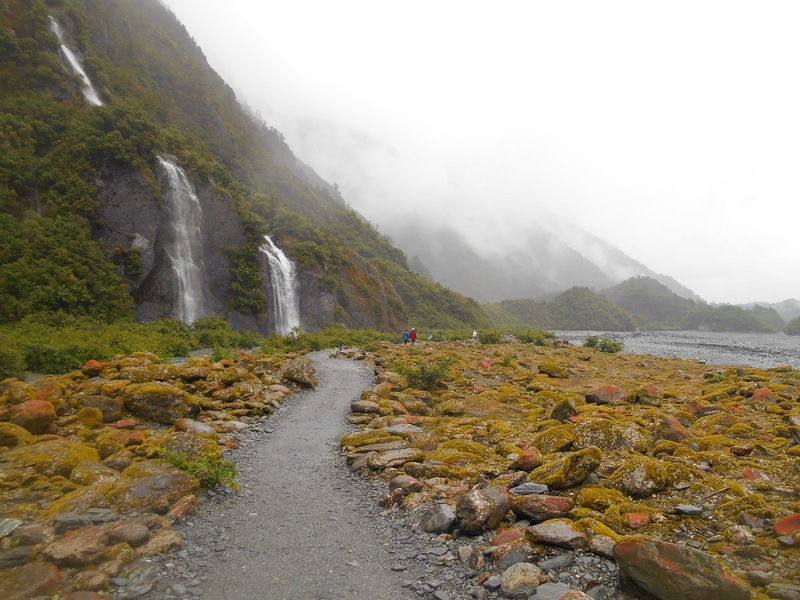 The inland journey passed the Haast Falls, turquoise falls rushing over large rocks. 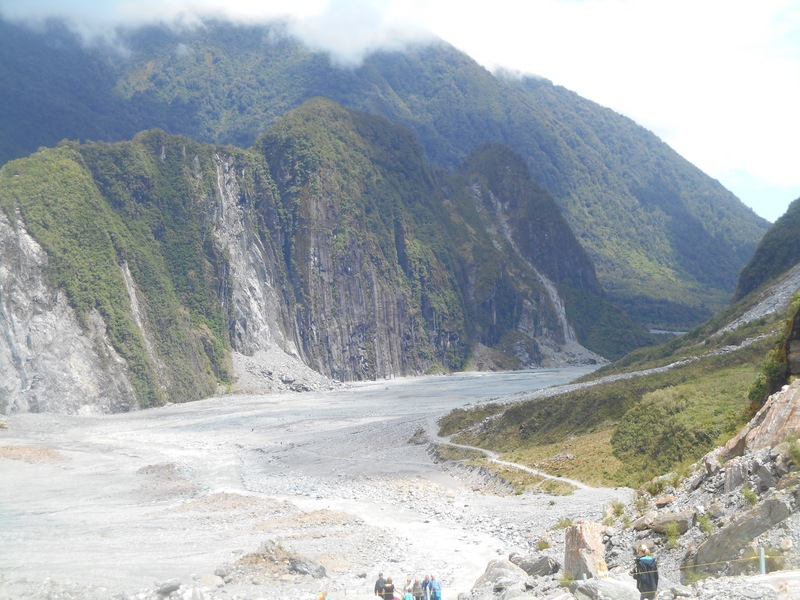 The Haast pass was high elevation and would have been a breathtaking ride, in both senses of the word. Arriving at Makarora we optimistically put up our tent and went to the bar, where we got chatting the staff who said there was a weather warning for 9pm. After dinner the heavy droplets started and we got ready to hibernate for the night. The sleep was disturbed by lightening and winds which by midnight threatened to take the tent cover away. I found the kitchen open and just as a gush of wind exposed us, we moved inside. We were far to awake and a little on edge by this time, but may have napped on the sofas from 3am until 6am when other wet campers began to roll in. The photos of the glacier are wonderful. It must have been a breathtaking reward after the steep cycle. The weather seems to have been an ongoing challenge especially when you had to abandon the tent in the middle of the night. I admire you both.